We highly recommend Abderry for breaking in services. You broke in two of our beautiful fillies a little while back now and both horses (we were advised), went on to performance level and excelled. Their new owners were extremely happy with them. Your breaking in service was exceptional and the process was fast and efficient without being rushed or compromised! Both horses responded well to their training. We will definitely use your services again and highly recommend you and your team. The way your horse reacts to his Breaking-In education will affect every aspect of his or her life, and it can be one of the most intimidating and confusing times they may encounter, if there isn't a mutual understanding between them & and their trainers. The Breaking-In period can change their life, and it can also destroy their future career options. It can solve problems, or it can create them. Abderry has a simple mission — to educate and train horses to achieve their full athletic potential. We want you to be proud of your horse and we aim to produce high achieving athletes, both mentally and physically for the NZ Equine Industry. We want your horses to trust that we’re not going to abuse their trust. We reward their achievement and perseverance by treating them as individuals - ONE SIZE DOES NOT FIT ALL. We charge a Flat Fee to give your horse the opportunity to learn at their own speed. If they're nervous and highly strung we'd rather give them longer to work things out, we don't rush them. Your horse must be comfortable mentally & physically each step of the way before progressing, so we aim to provide a series of enjoyable experiences that he or she will remember for the future. Indoor Round School (Diameter 25m) – our main Classroom – all horses are assessed, and learn to Lunge & Long Rein in here before heading on ‘outside‘. Main Stable area – Our floors are fully rubber lined for safety, has 26 large Boxes, and includes our purpose built Crush and warm water horse showers. Arenas – Four Kaiaua Sand & Shell arenas in various sizes, plus a 600 m sand track and large grassed riding areas. On grass (in dry weather) we have a fully decorated 20 x 60m Pipe Dressage Arena. Long Reining & Hacking Out – we have 120 acres of farmland with tracks & raceways. When being long reined or ridden out later on in their education, horses will meet everything from Tractors & Quad Bikes to sheep, cattle, working dogs…...and other horses. All horses @Abderry are worked on their own & in company as stages of education require. We take horses in work here out to our Shows for further exposure, led, or ridden, depending on where they are at. Lots of different people – Yep. We have experienced riders. 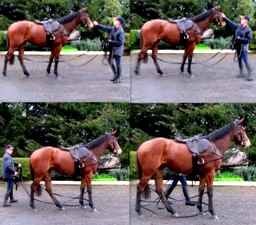 All horses are ‘trained’ using Cheski Browns training methods and beliefs……. our staff are 'managed' by her so all the horses, while they may be handled by different people (including Cheski), all receive the same standard and education criteria. Owner Participation - When you visit (as often as you would like to or can) Cheski is with you at each appointment, taking you through what your horse is learning & his or her attitude to what is being taught. Our Stable work hours are 7am - 3pm six days a week, Mon-Sat (we try to close on Sundays and Public Holidays) so by appointment, we will be pleased to show you the progression of his or her education. When your horse is ready to come home, firstly you will be shown him or her ridden - then you will ride & be talked through “how” to ride him or her. We take great pride in this part of the Breaking-In process and make sure that you are completely aware of how you need to handle/manage/ride your horse when you get him or her home. We are always available to answer any questions you might have on the on-going management of your horse after you have taken him or her home. Race horse or Sport horse, the basic education is the same. Stan and I have had at least 10 horses broken in/educated at Abderry by the very competent caring staff. All of these horses are well behaved and successful at our chosen occupation for them. The greatest attribute they all possess is calmness and confidence.. As an example of Abderry education a 2 year old filly went to the track for the first time today. Her behaviour , loading on the truck, standing calmly in the tie ups and going out onto the the track to work was all exemplary behaviour reflecting her Abderry professional early education.